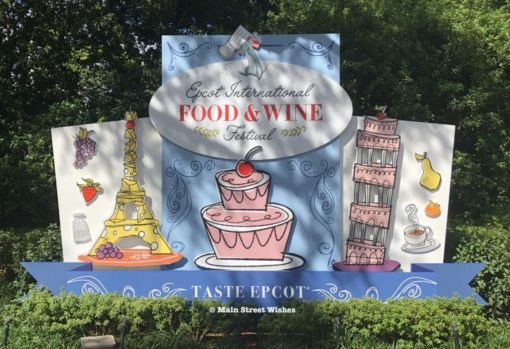 The Epcot International Food & Wine Festival is one of Disney’s most popular events. Each year the festival has run longer and longer, and this year is no different. Disney has announced that the 2019 Epcot International Food & Wine Festival will run from August 29 – November 23, 2019. So for the first time in the festival’s history it will be running for 87 days! That will give guests plenty of time to check out everything it has to offer. Food & Wine is jam packed with different activities and experiences, so everyone in your group should be able to find something they like. During Food & Wine there are extra booths set up throughout the World Showcase and in part of Future World. There are a good amount to choose from, usually over 30, so it’s a fun way to snack or drink around the world. Each booth will either represent a country or have a certain theme and there are a few food and drink options to choose from at each booth. The food is not a full meal, so it’s perfect for snacking and sharing, that way you get to try more. Remember to pick up a Food & Wine passport when you enter Epcot, they are usually right by the entrance and they are free. In the passport you will find a checklist for each booth, so you can keep track of what you have tried. For an extra cost guests can try one of the many seminars that are offered during food and wine. There are both food seminars and wine seminars, so once those lists are released take a look and see which ones interest you the most. During Food & Wine there will also be different culinary demonstrations that guests can sign up for. During these demonstrations the chef will give guests in the audience different tips and tricks to help up their kitchen skills. This is a fun part of the festival where guests can go to the American Theatre at certain times to see different musical performances. There will be a variety of types of music lined up for this concert series like pop, rock, R&B, country, Christian, swing and Latin artists. Disney will announce the lineup ahead of the start of the festival so you can see who will be playing during your travel dates. The best part about this is that it is included with park admission, so you do not have to pay extra for this. This is just a glimpse at the different experiences of the Epcot International Food &Wine Festival, because there really is quite a bit to do. It’s definitely one of my favorite times to visit. Here’s a little tip though, plan to go during the week, because it can get very crowded during festival time on the weekends. Disney will release more information in the coming months and I’ll keep you updated when that information is released. Are you excited for this year’s Epcot International Food & Wine Festival? « Where is it Wednesday: Where is this Decoration Located in Disney World?